Browse to the /var/packages/FileStation/target/etc/conf directory. I will update this post as I try this solution. There are official instructions to installing WSO2 API Manager that can be found here, but I found them lacking in critical details. The walkthrough below lays out the detailed steps for doing this. I spun up the cheapest $5/month VM at Digital Ocean to keep costs down as I experimented. These VMs have 20GB of hard disk and 512MB of RAM, which are FAR below the recommended sizing for API Manager. I recommend adhering to those guidelines if you are deploying to production. Login to Digital Ocean and spin up a preconfigured Ubuntu 14.4 x64 Droplet. Once provisioned, update the Droplet to have the latest packages (sudo apt-get update, sudo-apt-get upgrade,sudo apt-get dist upgrade) and reboot into the latest Linux kernel. Download the WS02 zipped binary from here, and copy it to the Droplet. Its 381Mb in size, so it may take awhile to download. Note that logs for the server are kept in the /usr/local/opt/wso2am-1.10.0/repository/logs directory if you need to review them. The wso2carbon.log contains a great deal of useful information. Note that it takes AWHILE to startup the server, as a number of applications have to be deployed. Be patient and expect high CPU usage. 15. OPTIONAL: change the listener. 17. The main login screen will look like the screenshot below. Note that I have deployed a sample API app. You are using an outdated version of pyOpenSSL: mitmproxy requires pyOpenSSL 0.14 or greater. 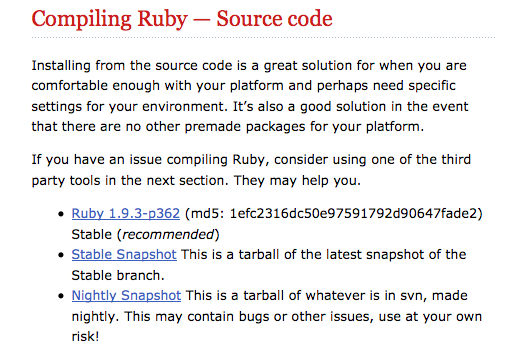 2) Check your current version of ruby. 4) List the versions of Ruby that RVM knows about. 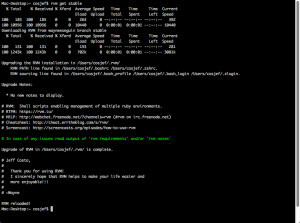 5) Upgrade Ruby by passing in the name of your current version and the top-level version number. 6) Select Yes to comments the upgrade. It may take some time to complete, as Ruby must be downloaded and compile, but finish without incident. Note that the installer will also offer to move your gems to the new version, while deleting them from the old version. It will also offer to move your aliases and wrappers. For convenience sake, its advisable to accept these choices. Are you sure you wish to MOVE gems from ruby-2.0.0-p247 to ruby-2.0.0-p353? 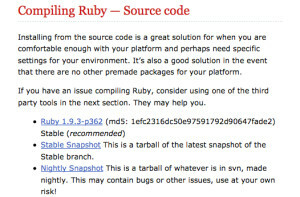 7) Removing old, vulnerable version of Ruby. 8) If all has gone as expected, you will see a confirmation message. 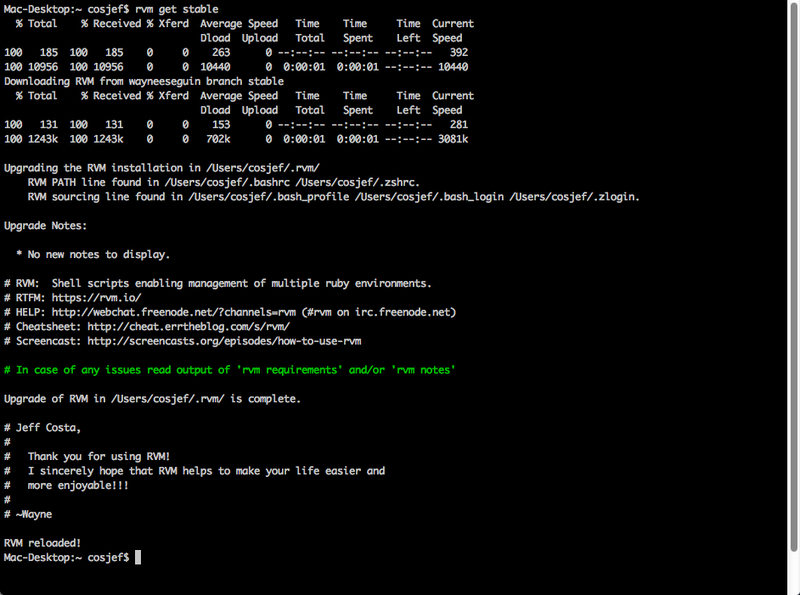 9) Set the upgraded version of Ruby as your RVM default. Starting Chrome on a blank page. 1) Settings -> On Startup -> Open a specific page or set of pages. 3) Click the X to delete what you find there. 5) Click OK to save the change. Now completely close out of Chrome, and restart it. You should be brought to a blank page. This also has an option to install the Git command-line tools. Choose that option. Latest Ruby version not showing up in RVM? Annnd there’s the 1.9.3-p362 version, ready for installation with the usual “rvm install ruby-1.9.3-p362” command.